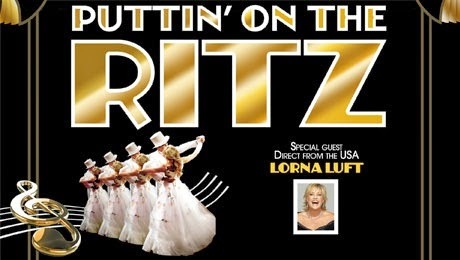 Quickstepping into the Edinburgh Playhouse this week is the UK tour “Puttin On The Ritz” – a musical celebration of the acclaimed work of George Gershwin, Irving Berlin and Cole Porter. And to top it off, it even features Special Guest Star (and daughter of Judy Garland), Lorna Luft. Whether you are an expert on the work of Gershwin, Berlin & Porter, or a newcomer to their sweet melodies, chances are there are plenty of songs you’ll know. “Puttin’ on the Ritz” visits all the hits of Hollywood’s golden era of the 1920s & 30s. The show itself is rather simpler than perhaps first expected. A live band has been overlooked in favour of backing tracks, and the glistening sparkle of the set never really changes. A variety of dynamic choreography, concoted by Emma Rogers, was performed with oodles of style by the 16-strong ensemble of dancers, working through classics like Anything Goes, Let’s Face The Music and Dance and I Got Rhythm. Singing was really fantastic too. Sarah Earnshaw in particular emoted a couple of stellar solo tracks, exposing and really portraying the truth of the lyric. Paul Hazel was a cheeky chappie, adored by the audience and Emma Kate Nelson & Simon Schofield’s song & tap routine to It Don’t Mean A Thing If It Ain’t Got That Swing was also a highlight. Special Guest Star Lorna Luft provides great value for money, despite hardly touching any of the repertoires of Gershwin, Berlin or Porter. Her rehearsed patter and anecdotes are affectionate, but it’s her voice that will send shivers to those who have long listened to recordings of her mother. Close your eyes and be amazed at how the texture and style of Luft’s vocals invoke the memory, long after the final note of The Man That Got Away (written by Harold Arlen and Ira Gershwin, made famous by Judy Garland from the movie A Star Is Born). Perhaps trading on the back of Strictly Come Dancing’s revival and popularity, the costumes contain enough sparkle to make Liberace seethe with jealousy, however the choice to use backing tracks created a flat sound in the circle and felt “inoffensive” to the ear, arguably a good thing considering the average age of those in the audience – but this reviewer’s opinion is that the classics of Berlin, Gershwin & Porter are best enjoyed by a rousing full live band – the melodies reaching skyward, soaring loudly into the Playhouse rafters. The impression instead is of ‘Broadway-lite’. Interestingly, one of the best segments of the show was when the performers veer from the main composers’ material and visit ‘The Cotton Club of 1929’, and visit hits like Ain’t Misbehavin, Up A Lazy River and Birth of the Blues. The show would perhaps benefit from a better exploration or explanation of the songs and the composers themselves, giving the audience a reminder why these songs remain so special after nearly 90 years. Special guest Lorna Luft and the cast perform everything impeccably however, and they make the songs come alive.